Publisher: Bromyard & District Local History Society, 1988. Soft Cover, 176 pages, 7.25 x 9.50. 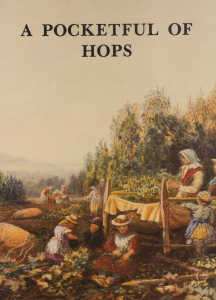 This book is essential reading for those interested in hop growing, and for those curious to learn how the cultivation and marketing of hops fit in to the local economy of north-east Herefordshire. It is hard to imagine the disruption of normal commercial and social life that only a generation ago would descend on Bromyard and the surrounding countryside for a month each year. September meant one thing � hop picking. During hop picking the usual pattern of life was disturbed for the whole area. Bromyard became a ghost town with nothing stirring � except on a Saturday afternoon. No public functions were held and nothing could be done until 'after hop picking'. Hop farmers and their families remained at home except for essential business and shopping, and meals were fitted in to suit bushelling and kiln changes. As the year begins to turn into Autumn and there is a certain misty freshness in the morning air with the promise of warmth later on, local people still say, 'It's a real hop-picking morning.' They seem to sniff the air and nod in agreement that whatever they are about to do they would much rather be setting off to the hopyard for a day's hop picking, as they would have done thirty or forty years ago. In the researches for this book, letters were written to some of the Birmingham and Black Country newspapers asking people to write their memories of hop picking before the days of the machine. We were surprised to get such a large response to our enquiries and find what happy memories the old hop-picking days evoked. Of course, these letters are from older people who came hop picking as children and perhaps remember the old days with childhood affection; to their mothers hops meant hard work in good weather and bad, and a few shillings towards the family needs. The many thousands of hop pickers who came into the countryside required a great deal of care and organisation, involving the local Churches, medical services, police and education authorities. But first the pickers had to be brought to the district and this was the responsibility of the railways and later, road transport. The Bromyard News and Record of 31 August 1905 has details of the arrival at Bromyard that week of the hop pickers' special trains, and lists the number of pickers, not counting the numerous children, destined for various farms in the district. The late Ted Holloway of Lower House, the Bull Ring and Hope House in Stanford Bishop, and Sevington in Acton Beauchamp, kept a series of day books covering the years 1951 to 1977. The establishment of the picking machine in the mid 1960s caused infinite regret to many people, but surely sighs of relief were heaved by farmers' wives and families. Life must be easier for them than during hand-picking days now that more depends on a well-regulated machine and less on unpredictable hungry human beings. However, for the high quality crops wanted by the brewers today, hops have to be harvested at the peak of their condition. This means working for the maximum number of hours during that time, and Gwenllian Paske of Upper Lyde, writing in I 988. begins her account of how hop-picking affected the farm-house with sentiments remarkably familiar. Hops must be carefully dried and special buildings have been developed for this purpose in Herefordshire these are known as hop kilns, but in other areas they are termed oasthouses. An early method of drying was to spread the green hops on an upper floor or in an attic and allow them to dry naturally. In his book 'A Perfite Platforme of a Hoppe Garden' published in 1574, Reynolde Scot describes such a method: "If you have no Oast dry them in a loft open to the air as maybe lay them not above half a foot thick and turn them once a day at the least, by the space of two or three weeks sweep them up into a corner let them lay for as long more." Some local growers without kilns were using Scot's method as late as the 19th century, whilst others took their hops to be dried by neighbours; eventually most hop growers built their own kilns. In 1842, for example, there were 23 farms in Stoke Lacy growing hops, of which at least 14 are known to have had kilns or to have built them later. Since the Second World War the methods and productivity of British agriculture have probably altered and improved more than during any equivalent time span, and in the following calendars Harry Paske explains the differences that have occurred in hop growing. The system described before 1950 is as he remembers it at Little Froome. Hop growing was given up there in 1964 so he has described his own system at Upper Lyde for the 1980s. Few industries have changed more than hop growing in the last seventy years. The fundamental part, the hop has changed; cultivation, pest, disease and weed control, picking, drying and marketing have altered, and the growers and their labour have had to develop entirely different skills. Apart from in America where machines have catered for much bigger farming operations, Bromyard was the original centre of the development of hop-picking machinery throughout the world. In 1934 McConnel Hinds of Martley built a prototype flying finger' hop-picking machine. Norman Edwards of Rosemaund (where the Experimental Husbandry Farm is now), having watched the developments, installed a machine for the 1937 harvest. Ernest Griffiths of the Stocks, Suckley, James Bomford of Spring Hill near Pershore, Tom Hawkins at Thinghill Court and Fred Coleman in Kent were also using this early machine. After the war, in 1949, Percy Parker at Newton Farm, Stoke Lacy, also had a McConnel Hinds flying finger machine, although by then it was installed by Rubery Owen of Darlaston. This model, however, never subsequently became popular. George Hinds and McCoimel later split up and George Hinds continued with hop-picking machines from Barnard's Green, Malvern. He also designed a Rotobank mobile harvester which could be driven from the PTO (power take oft) of a tractor or Landrover and which he exhibited in Germany. Several attempts have been made by different makers to manufacture mobile picking machines but very few have been sold, perhaps because they tend to be too cumbersome for convenient movement in the restrictive wirework of hopyards, and in wet seasons there would be the fear of being bogged down and causing considerable structural damage to the soil. One of the many problems for hop growers is that it has only one significant buyer � the Brewer. To try to reduce this dependence, other uses have been explored from time to time.